In honor of Fire Prevention Week, the Mount Dora History Museum has a new display of cast-iron fire apparatus models. The collection dates from 1910 to the 1940s. The museum is open Tuesday through Sunday from 1:00-4:00 pm at 450 Royellou Lane in Mount Dora. Museum entry is $2 for adults, $1 for students, and free to Historical Society members. For more information, call 352-383-0006 or visit www.mountdorahistorymuseum.org. 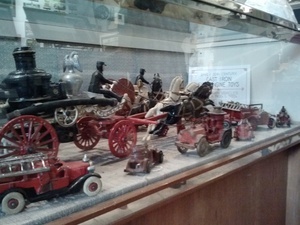 Toy fire engines first appeared around 1880, made of cast iron and tinplate. Known as fire wagons, these toys included pumper wagons, horse-drawn chief's wagons, ladder wagons, and other accessories. Interestingly, the toy fire trucks of the 1920spredicted the engines of today. While the Great Chicago Fire was the best-known blaze to start during this fiery two-day stretch, it wasn't the biggest. That distinction goes to the Peshtigo Fire, the most devastating forest fire in American history. The fire, which also occurred on October 8th, 1871, and roared through Northeast Wisconsin, burning down 16 towns, killing 1,152 people, and scorching 1.2 million acres before it ended.